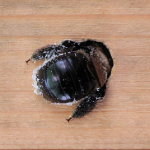 You are here: Home / Common New England Pests / Take the Sting Out of the Carpenter Bee! It’s all right there in its name: Carpenter bee. This dastardly creature is the real thing. Complete with the ability to chain saw its way through structural woods. Who are they, what damage can they rain down, and what can you do about them? These are the questions of the moment. Other than for their nuisance factor, most bee’s pose little threat to us. Among the exceptions is the Carpenter Bee. These large bodied bees come in one of 500 species and are found throughout the world. Resembling the Bumble bee in many ways, but larger, they are hairless and shiny with a black abdomen. The threat posed by the Carpenter bee takes its toll over time. Over a few short years the brood of bees grows and with the increased numbers comes the damage. It is their targeting of the wood structure found in many homes where the real damage occurs. Known for their ability to drill into the wood and burrow off into different areas of their target home structure is damaged, weakened, and even destroyed. The preference of the bee is wood larger than 2 inches thick. The wood attacked by these little creatures is not eaten, but becomes the shelter and a nursery for raising their young. Their taste in wood runs of mostly untreated and exposed wood. The excavation has even shown up in wooden lawn furniture. To their advantage most of us don’t like messing with bees. There seems to be a phobia-like reaction to them. We assume that all of their activities are centered on the important function of pollination. Many times their number is underestimated or the species is not identified. As you might imagine, over time the damages done to the wooden structure of a home can become quite serious. This is especially true when the wood converted to the personal use of the Carpenter bee happens to be a support beam. 1. By using a store bought insecticidal. Be sure to carefully follow the instructions to avoid the dangerous fumes or even the sting of an enraged bee or worse yet, bees. 2. The favored choice of many is to hire a licensed pest control company. Whichever your choice, there are two other preventative measures you can take after the bees are gone. Apply a recommended wood treatment to the at-risk and exposed wood areas of your home, and make sure to have someone examine the nesting area to assess for damages.